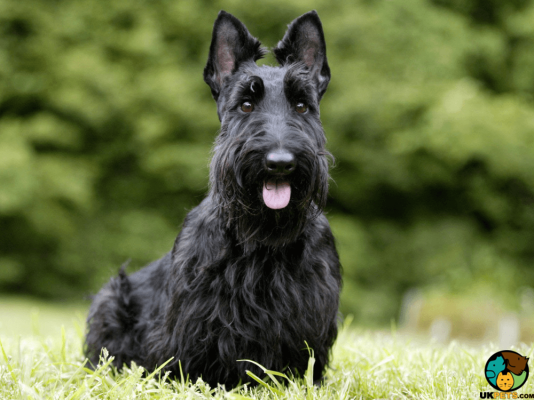 Searching for a Scottish Terrier? Outgoing and lively as a puppy, the Scottish Terrier develops into a courageous, jolly, yet sturdy and imposing adult, with more independence than most terrier dogs. It is confident and fearless but also stubborn and grumpy at times. Scotties are highly prized for being brilliant ratters since they are natural earth dogs that owners will enjoy a rodent-free yard. Do you want your own Scotties at home? Here is complete background information of this lively and devoted dog breed. The Scottish Terrier is a British terrier developed in the Scottish highlands. Its history is unclear but most believe that the breed dates back to the 15th to 16th centuries. Scotties were developed in Britain to hunt and kill vermin that ate grain, eggs and poultry in the farms. They were bred to be courageous and scrappy dogs, ready to follow and hunt fox or badger by digging their way into the den, if necessary. In the late 1882, there were three different terrier dog breeds exhibited as Scotch Terriers including Scottish Terriers, Cairn Terriers, and West Highland White Terriers. The Dandie Dinmont Terrier had been initially included, but since it has apparently a different appearance, it was separated into a different breed of dog. The Scottish Terrier was only recognised as its own formal breed in the 19th century. Today, the Scottish Terrier remains a favourite both as a companion dog and family pet thanks to its charismatic looks and its kind, albeit gutsy natures. The Scottish Terrier is relatively small breed. It grows to about 18 to 22 pounds in weight and 25 to 28 centimetres in height for both male and female. It is a compact, sturdy, short-legged dog with a long head, large muzzle and a bearded face with bushy eyebrows above its dark piercing eyes. The ears are finely textured, either pointed or straight and are set on top of its head. Scotties have double coats made up of hard, wiry topcoat and a soft and dense undercoat. The coat comes in various colours including black, wheaten and brindle. If they are to be house dogs, they only need to be brushed at least once a week. On the other hand, show dogs need to be brushed daily, and hand stripped twice a year. Also, Scotties should only be bathed as needed since excessive bathing may irritate their sensitive bodies. As part of its dog grooming regimen, always check the ears on a weekly basis for any signs of infection, wax build-up or irritation. Brush the teeth regularly to prevent tartar and gum disease. Also, nails should be trimmed at least once per month, especially when you start hearing clicking sounds on the floor. Like most terriers, the Scottish Terrier is an independent dog with a mind of his own. However, unlike its cousins, the Scottie is reserved and discerning of its particular choice of company. It is loyal to its owner but is more a one-person dog, sensitive to its chosen master’s moods. It is wary of strangers and barks a lot, which make for a quite intimidating watchdog. With this said, socialisation should start early for the Scottie to become a well-rounded adult dog. The Scottie’s stubborn and independent nature makes it difficult to train. It has a high self-esteem and iron will, thus it is not an ideal choice for permissive dog owners. The new Scottie owner should have a firm and consistent leadership and should immediately enrol the breed to an obedience school. If left unchecked, the Scottie will dominate the household. Scotties tolerate boisterous children, but they are best suited in households with older children who know how to behave around small and scrappy dogs. However, if you already have a Scottie and small children at home, just make sure that playtime is always supervised by an adult to keep things calm. In addition, the Scottish Terrier is territorial, which means it may not take it well when other dogs come over to play. However, it gets on well with other dogs and cats it has grown up with in the house. Scotties will also think nothing of chasing other cats and small animals they encounter with rollicking enthusiasm. A typical serving for an adult Scottish Terrier is 1 to 1 1/2 cups of high-quality dry dog food divided into two meals. A dog’s nutrition should be catered to its unique needs through various life stages and situation. Its dietary requirement is determined based on its age, size, metabolic rate, health, and activity level. Work with a veterinarian to decide the best diet and increase the longevity of its life. Here is a typical calorie per day of a standard Scottish Terrier adult weighing 20 pounds. Dogs need a balanced diet with at least four nutritional essentials such as proteins, fats, vitamins, minerals, and other micro-nutrients. They should also be given plenty of clean and fresh water to stay happy and healthy. The Scottie is mostly a healthy dog breed, but like most dogs, it is susceptible to certain health disorders including Von Willebrand’s Disease, Skin Problems and Flea Allergies, Epilepsy, and some Jawbone Disorders. It is also predisposed to the so-called Scottie cramp – a motor condition that causes walking difficulties. The Scottish Terrier is an active dog with high levels of energy and so will require at least one hour of daily exercise. It is also an intelligent dog breed, so plenty of mental stimulation is a must. If Scotties are not given ample amount of exercises and mentally stimulating activities, they will quickly get bored and exhibit destructive behaviours such as digging, chewing and barking. The price of a buy a well-bred Scottie is around £400 to £900 from a reputable breeder. Pet insurance for a 3-year old Scottie will cost about £20 to £40 a month. Dog food (high-quality, commercial or homemade) will set you back £20 to £30 a month. Veterinary care (include visits, vaccination etc.) quickly adds up to £800 a year. Dog supplies and equipment will cost £200 for a one-time purchase. Overall, you will have to spend anything from £50 to £80 a month when you decide to buy Scottish Terrier in the UK. The Scottish Terrier is highly prized as a brilliant ratters. It is outgoing, lively and independent, but a bit grumpy. It is loyal to its owner but is more a one-person dog. It is wary of strangers and is quite an intimidating watchdog.